Edouard Debat-Ponsan was a late nineteenth century artist who continued the traditions of his predecessors, treating diverse themes linked to Orientalism, landscape, history, religion, and portrait painting. Trained in the academic manner, his thematic diversity also chronicled the changing styles and preoccupations of the era. Born on April 25th, 1847 in Toulouse; the son of Jacques Debat-Ponsan (1804 - 1866) and Elisabeth Martel (1818 - 1875). He began his artistic studies when he was fourteen, attending the École des Beaux-Arts in Toulouse. However, aware of the fact that public artistic careers began at the École des Beaux-Arts in Paris he moved there and began studying under Alexandre Cabanel, one of the most successful academic masters of his time. Debat-Ponsan debuted at the Salon of 1870 with Le Récit de Philétas (The Story of Philetas) and Au sortir de la carrière (Leaving the Quarry), the same year that the Franco-Prussian war broke out, throwing France into a tumultuous period which led to the Commune. At this early point in his career, Debat-Ponsan treated mythological, historical, and religious themes, showing his reliance on the Ecole des Beaux-Arts traditions. His execution, too, in its detailed handling and idealized structure, was clearly influenced by the same traditions. After his exhibition debut, Debat-Ponsan remained absent from the Salon for the next four years, perhaps because he was preparing for his entry in the Prix de Rome competition of 1873. Many students entered the École des Beaux-Arts with the primary goal of obtaining the Prix de Rome, a coveted award for a young art student which provided them with four years of artistic study in Rome. While in Rome, winners could absorb an appreciation for the earlier Italian masters. This award virtually guaranteed the success of an artist upon their return to France. While Debat-Ponsan competed for the Prix de Rome, he was ultimately disappointed when he received a second place award. It is evident that early in his career Debat-Ponsan relied on the academic tradition in favor at the École des Beaux-Arts. This had implications for the understanding of his work since early on he was following a tradition which was being challenged by progressive artists such as the Impressionists who held their first show in 1874. Recent scholarship, however, has now shed more light on the importance of academic style painters who, despite changing trends, remained indebted to the academic tradition. After his defeat in the Prix de Rome competition, Debat-Ponsan worked again on establishing himself through the traditional Salon system, exhibiting under the name “Ponsan” early in his career, and then “Debat-Ponsan”, presumably after another artist by the name of “Ponsan” entered the scene. He returned to the Salon in 1874 with Le Premier Deuil (The First Mourning) and a portrait of a Dr. Piéchard, which earned him his first medal - a second-class award. This same year, the Institute also awarded him the Prix Troyon, named after the famous animalier Constant Troyon. It was given to young artists specializing in animal-landscape painting. After just two Salon showings, Debat-Ponsan was already beginning to make his mark on the Parisian art world and to be recognized by those in power. During the 1870s Edouard met and married Marguerite Hortense Louise Garnier, the daughter of Louis Jules Garnier and Julienne Hanotin. The couple would have three children: Marguerite Jeanne (1879 - 1929) who became a doctor; Jacques (1882 - 1942); and Simone (1886 - 1986) -- Simone's first husband was Jacques Dupré (the son of Julien and Marie Dupré). Debat-Ponsan’s animalier images became an important component for the diversification of his oeuvre. At the Salon of 1875 he exhibited Les vaches à l’abreuvoir (Cows at the watering hol e), an early attempt at this type of theme. Introducing animal studies into landscape painting became popular with other artists such as Troyon, but also the Bonheur family and the Van Marcke de Lummen family of the previous decades. Many of these French artists were in turn inspired by seventeenth century Dutch animal painting such as Paulus Potter. Debat-Ponsan’s images introduced an element of personal leisure into these compositions, whereas other animaliers concentrated solely on the activities of the animals. That Debat-Ponsan focused on a human presence in his animal paintings also shows that he was interested in depicting peasant life in the tradition of Jean-François Millet, then becoming recognized as one of the leading masters of the Barbizon heritage. Both of these aspects of his work show that Debat-Ponsan was working with already-recognizable themes that had been introduced several decades earlier. Another important part of his diverse oeuvre was his Orientalist themes. In 1882 Debat-Ponsan traveled to Turkey, following in the footsteps of many other French artists who left Paris to seek out the exotic Orient as described by writers and other artists of previous decades. “Orientalism,” as the tradition of painting Middle Eastern themes was known, produced many recognizable images at the Salons. Debat-Ponsan’s most widely acclaimed Orientalist image is his Massage, scène de hammam (Massage, hammam scene) from 1883. This work was exhibited at the Salon that same year, depicting a black woman massaging the naked body of a white companion. Implicit in many Orientalist works, including Debat-Ponsan’s, is the image of the white man, or woman as the case may be, as the cultural dominator. The possibility that he may have been uncomfortable treating these themes may have led to his rejecting Orientalism in favor of the other imagery. 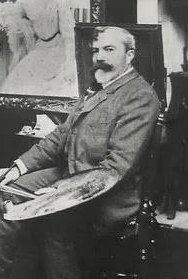 Debat-Ponsan was also an accomplished portrait painter with an affluent clientele. Many of these portraits were shown at the Salon, such as that of 1881 where he showed two. J. Buisson saw these portraits and wrote in the Gazette des Beaux-Arts of 1881 (“Le Salon de 1881,” pg. 43) that … The portrait of a man by Mr. Debat-Ponsan, another Toulousian, appears to be inspired by the manner of Mr. Laurens. It is very lively, and one of the best of the Salon for the manner in which the artist has set-off the sitter against the background. This same year he was given one of France’s most prestigious honors when he was named a Chevalier de la Légion d’Honneur. The following year he continued to receive further portrait commissions and exhibited two of these at the Salon of the same year; in 1887 he exhibited an equestrian portrait of General Boulanger. While Debat-Ponsan may have been, early on, driven by the goals of the École des Beaux-Arts, he became somewhat of a polemic figure later in his career. Once he had become better known in the world of art, he was able to free himself from the restrictions placed on young and struggling artists. Debat-Ponsan took liberal stances which occasionally alienated some of his clientele and exhibition jurors. His first encounter with officialdom was at the Exposition Universelle of 1889 in Paris where his work was originally accepted and he was even given a medal. Slighted, he refused the lesser bronze medal that was awarded to him. Then in 1898 he took the liberal stance of supporting Emile Zola’s position on the Dreyfus affair, recognizing the validity of Zola’s ideas in his article, “ J’Accuse!”. Debat-Ponsan found himself on the side of the revolutionaries, not on the side of many of his clients. Regardless, while his individual commissions may have been affected by his political stances, he continued to receive official commissions such as those for the capitol in Toulouse and the theater in Nîmes, from governmental officials of the Third Republic. He showed a sort of dual artistic personality, on the one hand standing in the same line as many other progressive artists who supported the exiled Dreyfus, believing that the government was wrong, while at the same time remaining a participant at the Salons and receiving lucrative commissions from individuals who were highly reactionary and conservative. After such conflicts, he retreated to the countryside; working on compositions based on his journeys in the Languedoc region in which he was born, executing many landscapes such as those previously discussed. He continued to exhibit at the Salon becoming the President of the Société des Artistes Français during his career. He died January 29th, 1913 in Paris. Debat-Ponsan was a diverse artist who did not restrict himself to one type of composition, and instead showed a predilection for many themes, each of which were well established in the repertoire of artists continually exhibiting at the Salon. He is a difficult painter to situate in late nineteenth century painting because his outspoken views about the nature of the political world were often not matched by the quality of his visual works. His work can be found in many of the (Musée des Beaux-Arts) art museums in France including those in Carcassonne, Dijon, La Rochelle, Nantes, Nîmes, Pau, Rouen, Toulouse, in addition to the Musée d’Orsay, among several other museums around France.